What’s your content management strategy? It’s been said that those who fail to plan, plan to fail. 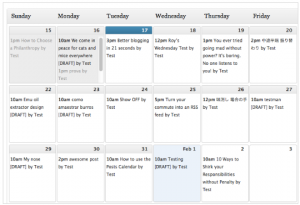 A Blog Editorial Calendar is a simple organizational tool to assure success. Part content strategic plan and part publishing schedule, it’s the foundation of strategic blogging. So let’s take a look at how to create order from chaos. But first, here’s what that little bit of planning ahead does for you in terms of getting the most audience engagement from your blog content. You become strategic and consistent, rather than random and ad hoc. You commit to your blog having a consistent presence, so your audience can commit to looking for you and reading you. You don’t become one of those TV shows we all stopped watching because their schedule became so erratic we couldn’t remember when/where to find them. By planning ahead, you drive perseverance. You provide structure to your creativity. You can still ‘wing it’ if that’s your style, but within a framework. Write whenever you’re inspired; then save the posts and drop them into appropriate slots on your calendar to ensure you’re reaching your audience(s) with timely and relevant content. Some bloggers create monthly or weekly themes. Others create different types of posts for days of the week (e.g., Mondays may be features; Tuesdays links; Wednesdays lists; Thursdays tips and Fridays photos). To help create a structure that works best for you, check out this list of 20 Types of Blog Posts. You bring discipline to your content, assuring that it’s balanced. You want something there for all of your readers, but you want it to be proportional. If you have 100 ice cream lovers, and 10 like vanilla while 90 like chocolate, you can plan in advance to post 10% of the time about vanilla and 90% about chocolate. You can also plan to create some longer posts; some short ones. This avoids blogger burn-out and reader fatigue. You can pay better attention to things like titles and key search terms so that you’ll generate more traffic. Take a step back to think about what your constituents might search for. Chances are they don’t think in jargon. Consider writing all your titles in advance (you can still tweak them once you’ve written the post) so that they group around themes and incorporate words on which your audience(s) will search. You can take advantage of holiday timing for posts, thinking about how this might relate to searching. Is it Valentine’s Day? Thanksgiving? Earth Day? Father’s Day? Check calendars for more obscure “holidays” too; the possibilities are endless (I just found out June is Adopt a Shelter Cat Month; Cataract Awareness Month; Children’s Awareness Month; Gay and Lesbian Pride Month, and Great Outdoors Month) Wrap these into your titles and posts if you can. You develop a scheduling tool that works for you. It can be as simple as an Excel spreadsheet template . It can be a Google calendar (watch this how-to video). It can be a Word document. It can even be a desk-top or wall calendar. It doesn’t need to be fancy; it just needs to be something with which you’re comfortable. If you use WordPress for your blog, you’re lucky. Zack Grossbart created a free Editorial Calendar Plug-in with a simple drag and drop interface. You can see at a glance – on one page — which blog posts are scheduled to be published, which are still drafts that need to be finalized, and which are just mere headlines or topics. Need to reschedule a post because something news breaking came up? Drag and drop. Notice that you’ve been talking too much about chocolate and vanilla and there’s been a surge of strawberry lovers? Drag and drop. They even have a forum where you can get support. Other tools out there include Basecamp, a shared spreadsheet in Google docs, a tool like WeekPlan, or a task manager like Asana. Just determine what works for you and your team. As with anything else, set up email or calendar alerts for yourself so you’ll stick to your schedule. You can link to a master communications calendar that includes major upcoming activities (e.g. mailings, events) so that you can piggyback on what you’re already doing. This helps you to repurpose your content to other channels and leverage the value of the time you spend on your blog. You establish your authority within your industry or niche. Simply by adhering to a consistent schedule of writing about particular subjects, you will begin to create a body of content that will establish your authority in your niche area. People trust consistency, depth and breadth. Remember, your calendar is just a guideline to help you. If a great story comes up, by all means abandon your schedule and be spontaneous. Just move whatever was planned up ahead in the schedule. Relevant content trumps everything else. Did you find this post useful? Please let me know. And if you have tips for organizing content, please share! NEXT POST: A potpourri of concrete ideas for engaging blog content and calls to action. Great insights. Nice overview. Thank you for sharing! Thanks for reading! Hope this is helpful. At first glance, this is a very informative post covering many aspects of bloging. You make it sound so easy! I am learning new things every day thanks to people like you who are willing to share their knowledge. I have written a book… hopefuly it will be published in a few months. Is a web side and/or bloging absolutely necessary for its success? It seems to me that I will have to devote all my time to this, especially since I am so new. Thanks for this post! I will keep in touch! Glad you found this helpful Katina. I do think you need a blog/website if you want to develop interest in your book and, ultimately, plan to write more. It's the hub of a content marketing strategy. That being said, you can develop your own unique style. If time is an issue, create short posts with links to visuals or other content. There are many ways to skin a cat, as they say. Good luck! Thanks eclaire! Hopefully soon I will be able to embark on this journey, although I am sure this journey will have many bumps!